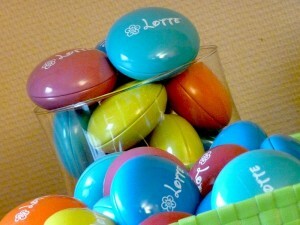 The shapes and images are especially designed for the little ones. 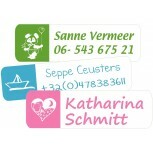 Ideal to brand all your baby items. 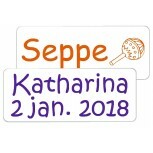 Our Baby Labels aren't just nice for your little ones, but they can also be a nice personal gift for baby showers. Avoid unnecessarily losses or exchanging pacifiers. Super hygienically! Ideal to use for the nursery. 24 pcs. Avoid unnecessarily losses or exchanging pacifiers. Super hygienically! Ideal to use for the nursery. 30 pcs. 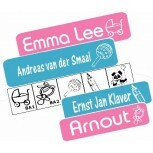 30 pcs super original baby name labels for ao. b ottles, plates, plastic bib or -toys. Ideal for nursery / daycare! 10 babylabels. Very suitable for bottles, plates or plastic bibs. Ideal for crèches and childminders. 24 pcs baby Label Points makes your life easier. They are fun and cheerful. 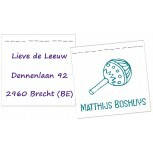 24 small round namelabels are practical and adhese firmly. 24 pcs iron-on labels. They are made of super soft flex material, easy to apply and durable. 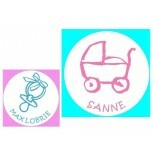 24 pcs convenient name circles for baby clothes. Small, but clear. Soft flex material. This indestructible, but very soft fabric labels, you sew easily in baby clothes and other textiles. 35 pcs.